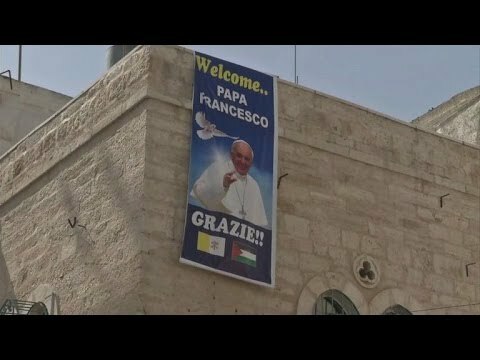 Vatican Secretary of State Cardinal Pietro Parolin is signaling that Pope Francis in his visit to Bethlehem on Sunday will strongly support the right of Palestinians to a sovereign state. Implicitly, Pope Francis will condemn the Apartheid system of military rule used by Israel in the West Bank, though he likely won’t use the word. In other words, Parolin is saying that the Vatican condemns the statelessness of the Palestinians, their lack of sovereignty or independence, their inability to circulate freely because of the Israeli pass system, and their inability to live in dignity, given the decades-long Israeli occupation. You put all that together, and you are describing an Apartheid system. Meanwhile Issa Kassissiyeh, the Palestine envoy to the Vatican, explains that President Mahmoud Abbas when he meets with Francis at Bethlehem on Sunday will express Palestinians’ anxieties about Israeli actions in Jerusalem that harm Christian Palestinians there, as well as about the conditions for Palestinians in the Israeli-occupied West Bank. Pope Francis will have lunch with ordinary Palestinians suffering from these practices, Kassissiyeh said. He will also meet with the Muslim Mufti of Jerusalem and visit the Mosque of Omar.